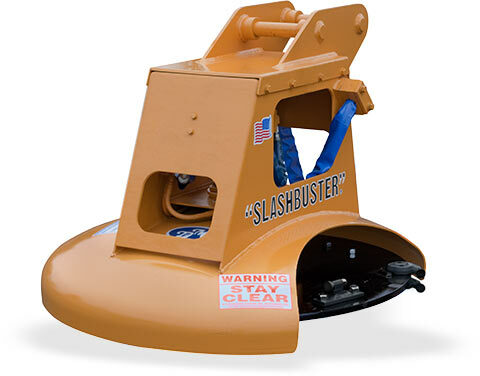 The XL 460D brush cutter attachment shares the same shroud as the XL 460 but substitutes a 44" mulching disk for the 46" flail blade cutter and also adds a brush rake that can be integrated with an existing hydraulic thumb. 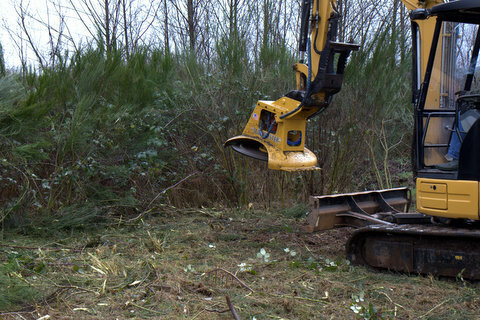 The addition of the mulching disk makes the XL 460D model productive in brush and trees 3 to 4 inches in diameter with an occasional 6 inch or larger stem. Note the larger stems mulched in this video measured from 3 to 4 inches. The unit shown is mounted on a Cat 305C and running off an existing auxiliary hydraulic circuit, providing 16.8GPM (3500PSI stall pressure) to the XL 460D brush cutter. As shown in the video, integrating the excavator thumb with this attachment is desireable a option for raking and piling debris. With an operating weight of approximately 800 pounds the XL 460D is a good match for 5 to 10 ton excavators capable of delivering a minimum 15GPM hydraulic flow and with enough counterbalance to handle its weight at full extension. XL 460D mulching a clump of tree stems. Invasive blackberry eradication, 4 minutes of continuous footage. Contact us today to discuss your application and request a quotation.